The Super Woman/Man is used to strengthen your erector spinae muscles. These muscles run starting at the base of the skull down to the tail bone. As the name states erector spine keeps the spine erect/straight. So, getting these muscles stronger promotes better posture. With our library of posture exercise, people can counter daily stress. Also, recover and prevent spinal conditions and symptoms. 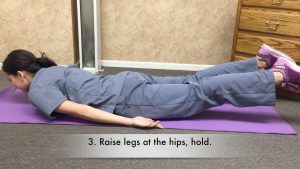 Warning: ONLY perform this exercise if you have no spine pain BEFORE this exercise. Start lying on your stomach with your chin, body, legs, tops of your hands and feet on a pad or floor. Raise your chin. Hold for 2 seconds, then relax. This will contract the muscles from the back of the skull down to your upper back. 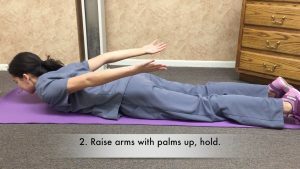 Raise both shoulders and hands. Keep your chin relaxed. This will bring your shoulders today to contract your middle back muscles. Hold for 2 seconds, then drop your shoulders and hands. Raise your feet and knees. This will contract your lower back muscles, glutes, hamstrings. Hold for 2 seconds, then drop your legs and feet. Repeat steps 1 to 3 two more times. Increase hold time to 5 seconds for each step. Then go to step 5. Full Super Woman/Man: raise the neck, shoulders, hands, feet, knees in this order. Hold for 2-5 seconds. Then relax. Repeat 2 more times.